Of course, for $1,500, it had better be fast. AMD's Radeon Pro Duo is here. 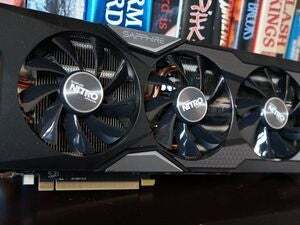 On Tuesday morning, the company formally unwrapped its much-anticipated and highly delayed dual-GPU card, giving it—at least for now—the fastest graphics card on the planet. With an asking price of $1,500—making it the most expensive modern consumer video card for gaming—it had better be fast. 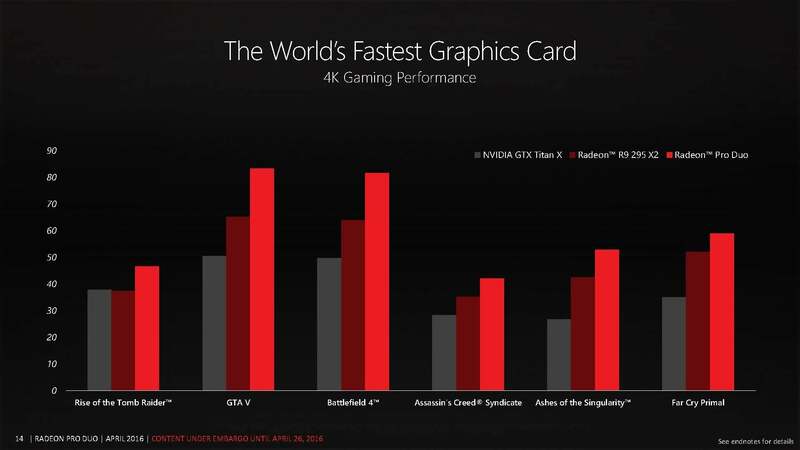 AMD claims a 1.5X performance advantage over a $1,000 GeForce GTX Titan X card. Why this matters: Gamers and PC enthusiasts are always looking for the next big thing to brag about, and the Radeon Pro Duo certainly qualifies. How long that will last remains to be seen, in light of Nvidia's reveal of its monster Pascal GPU earlier in April. Its reign may be short, but AMD's happy to wear the crown for as long as it lasts. 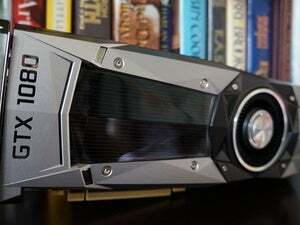 To back up the marketing, AMD shared a few benchmark figures comparing the Radeon Pro Duo against a Nvidia GeForce Titan X and its own older Radeon R9 295X2 card in various games at 4K UltraHD resolution. No surprise: The Radeon Pro Duo's brighter-red bars are longer and faster. 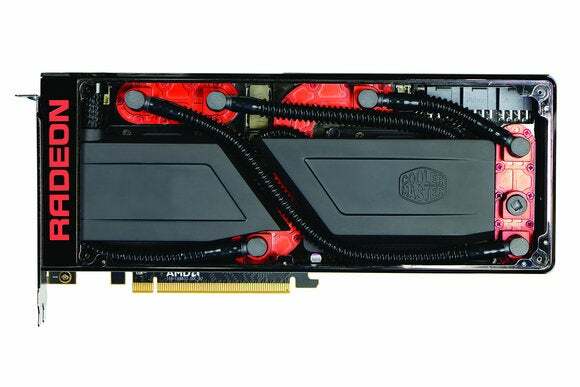 Two Titan X cards would compete more closely with the Radeon Pro Duo. But the term “fastest GPU” usually refers to highest performance out of a single video card—even if it has two GPUs on it. 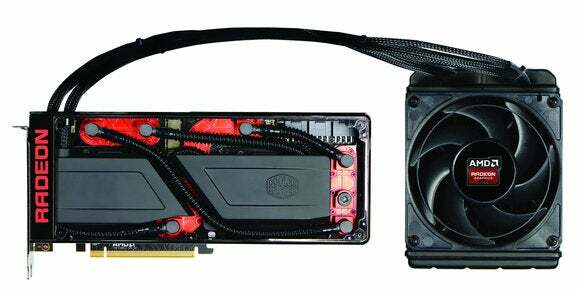 The Radeon Pro Duo is a liquid-cooled graphics card the company made by essentially grafting two of its Radeon R9 Nano cards into one. 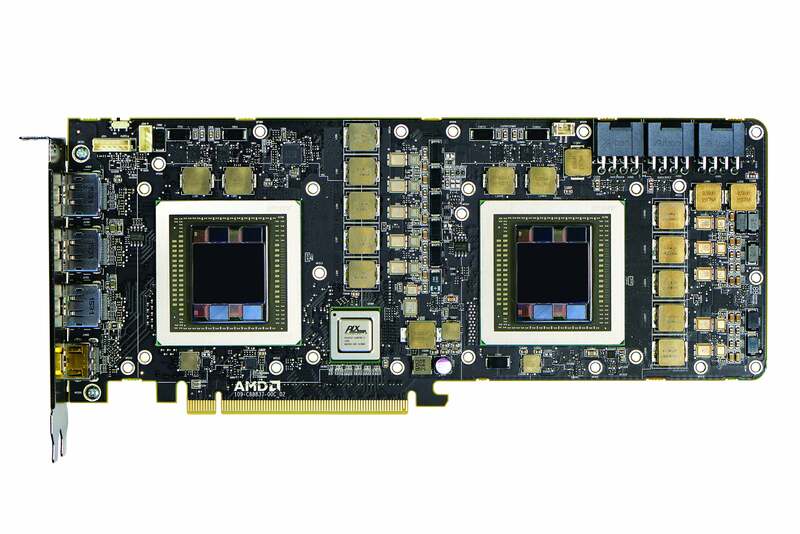 It also uses AMD's HBM memory, allowing for a far more compact package than a comparable card with GDDR5 memory, as is used with most GPUs. In this picture, you can see both cores with the surrounding stacked HBM memory, very close to the graphics cores. 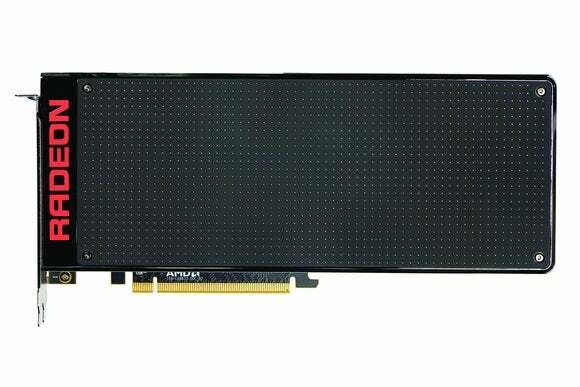 Total RAM on the card is 8GB—4GB per GPU on a 4,096-bit interface. Clock speeds of the cores are up to 1GHz, which just means the speed will ramp based on how hot it gets and how much power it uses. Two Fiji graphics cores make up the Radeon Pro Duo. Power is rated a very reasonable 350 watts. In fact, AMD officials have told us before that it could have made the card with just two 8-pin power plugs but decided to add a third for overclocking headroom. That, of course, implies overclocking will be better on the new card than on previous cards using the Fiji graphics core. A single, small radiator keeps both GPU cores and memory cool. There's just one problem: Nvidia's high-end Pascal, which looks like it'll be a monster with 15 billion transistors and HBM2 RAM. It’s unlikely the consumer gaming version will be that giant, and it may not even feature HBM2. 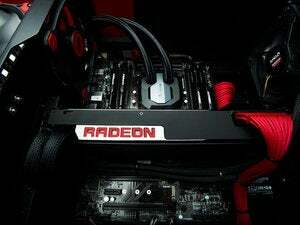 Still, Pascal is expected to launch this summer, curtailing the reign of the Radeon Pro Duo. Perhaps of more concern to consumers is the dearth of reviews on launch day. Hardware companies typically seed components to reviewers to coincide with the release of the product. 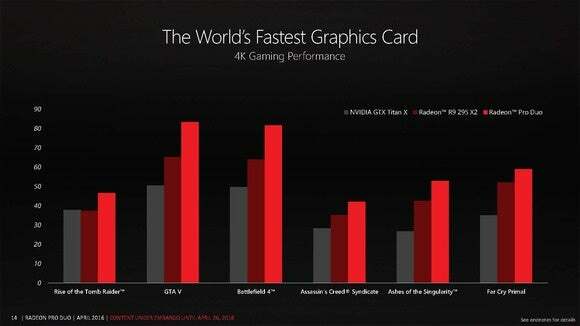 This time, for the most part, AMD appears to have skipped the early reviews. The reluctance is puzzling, because the performance shouldn’t be too surprising. We'd expect the Radeon Pro Duo to perform about the same as simply taking two Radeon R9 Nano’s and running them in CrossFire mode. This should have been an easy publicity grab. Still, if the numbers AMD's touting are true, the Radeon Pro Duo is the fastest GPU in town—for now.